Equipment Test – Riptide Vanquish BCD | Dive Industry Association, Inc.
We recently had the pleasure to field test the all new Riptide Vanquish BCD, exclusively distributed by IST. The Riptide Vanquish BCD is the latest creation of Industry Leader and BC Designer, David Pollock. Our Dive Team was gearing up for two FAM trips to the Caribbean and I wanted to minimize the weight of the diving equipment I was planning to take. I was looking for a light-weight travel BCD that still had the features and lift capacity of my current BCD, a well known and high-end brand. The Riptide Vanquish BCD turned out to be that BCD and more. At first glance, the Riptide Vanquish BCD seems to be a contradictory of terms. It is designed as a light-weight, travel BCD, yet it has the flexibility to adjust to many different body shapes and sizes and has 40 lbs of lift capacity. It weights only 4.5 pounds yet it has the capacity to be a weight-integrated BCD in a cold water environment or in warm, tropical waters. It has the smallest profile of any BCD currently on the market, yet it can be customized to accommodate a number of tech-D rings. 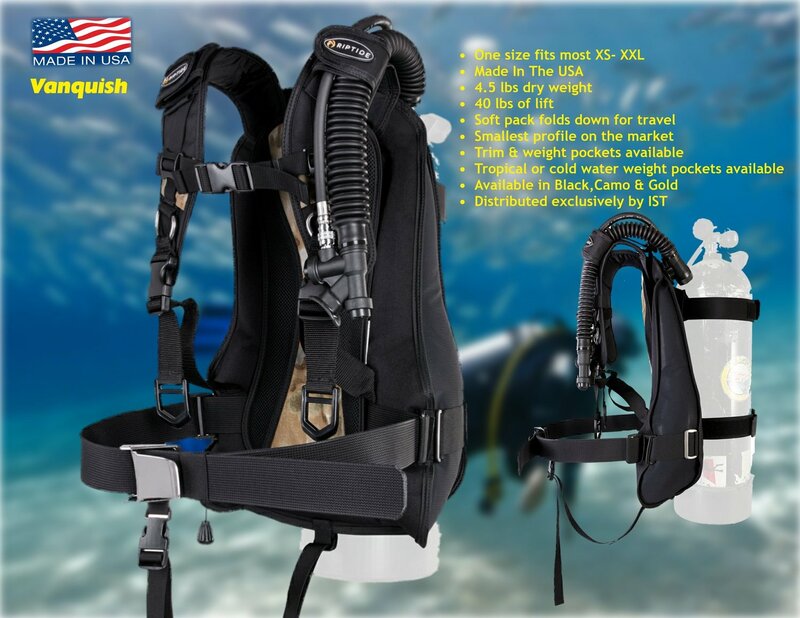 Depending on how you set this BCD up, it has the capacity to be an excellent travel BCD, cold water BCD or Tech BCD. The secret to the usefulness and success of the Riptide Vanquish BCD is in its addable features and how the BCD is set up. The Vanquish can be set up to give you an almost perfect feel and fit. We took the Riptide Vanquish BCD on a test dive in our pool to ensure that our adjustments were done correctly and we had time to get used to the new BCD. You think you know everything about BC’s? Think Again. We properly fitted the Vanquish BCD to our cylinder. No problem there. Pretty standard straps. Adjusting the way the BCD properly fit over my shoulder was a designer’s stroke of perfection in details. A few adjustments and we had a perfect fit around the shoulders. Next we adjusted the BCD fit the torso and waist. I chose to use the tropical trim & weight pockets instead of the cold water weight pockets. We adjusted them for level trim and made the final placement of the waist strap buckle. The Vanquish comes standard with a heavy-duty stainless steel buckle but I would prefer a light weight plastic buckle, that is easier for me to open and close. After adjusting the vertical height of the Velcro secured back plate pad and removing the crotch strap we were ready to dive the BCD. I’ve never been crazy about crotch straps and to tell you the truth, the BCD never rode up on me during the 9 dives I made with it. The pool test dive was a success and I was looking forward to our open water testing. Using the Riptide Vanquish BCD for the first time, I would highly recommend a test dive first. The Vanquish might seem to be very simplistic in design, but don’t let that fool you. It is a very well designed piece of equipment and its advanced features have been very well incorporated in its overall function. A properly adjusted Vanquish BCD may just spoil you forever. Take the time to adjust it properly and you’ll be diving a work of art. The Riptide Vanquish BCD did not disappoint us on our next two Caribbean Trips, to Dominican Republic and Saint Lucia. The BCD packed well and took up very little room. The tropical weight pockets packed flat and were used to protect our wrist instruments. The extra D-Rings we installed on the BCD held our dive computer, compass, secondary light and our emergency rescue sausage. The BCD was comfortable to wear and at times, I didn’t even feel like I had one on. 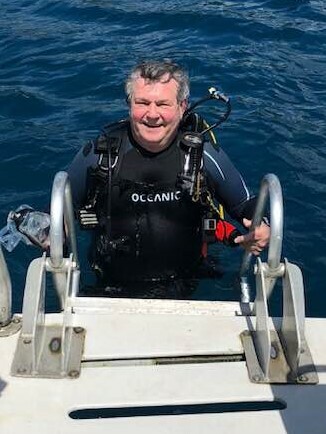 I made 5 dives in Dominican Republic and 4 dives in Saint Lucia. 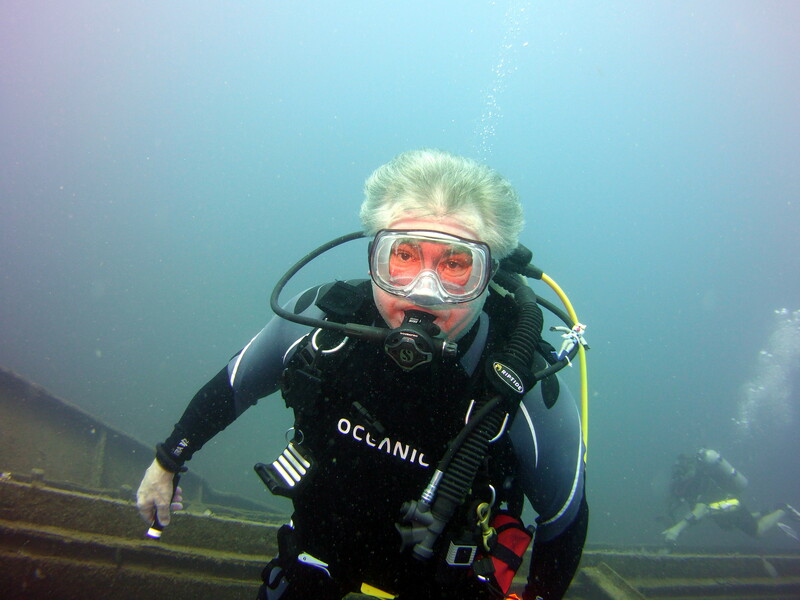 Our dives consisted of 45 foot reef dives and 80 foot wreck dives. I liked the fact I was wearing a small profile BCD as I swam through the wrecks in Saint Lucia. Putting a controlled amount of air into the BCD manually and pneumatically was easy. I could always find my inflation hose. I especially appreciate being able to deflate the BCD in a vertical, horizontal or invented position. Nice going Riptide. Needless to say, the Riptide Vanquish BCD got an A+ from our Test Team and a number of positive comments from the Divemasters and other Divers on our two FAM Trips. If you are looking for a light-weight travel BCD that has enough features built into it for the discriminating Diver, the Riptide Vanquish BCD is the piece of equipment you may want to see for yourself. IST Dealers can make an appointment to see the Riptide Vanquish BCD with David Pollock at the IST Booth # 2124 at the DEMA Show this November. This entry was posted in Gear Test. Bookmark the permalink.